Black guy: Nah, man. This is just for humor. This ain’t for real. I don’t think these are the same guy. You should really be careful with this kind of humor, you know. 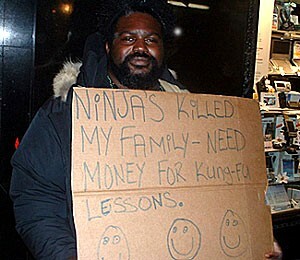 Some people are actually quite sensitive to “jokes” about ninjas killing their families. I learned this the hard way. It was really ugly… Trust me, you never want to be in that situation.